Badiyan, Badee, Bori, Kumhdouri or Adouri are the regional names of a dehydrated spiced lentil cakes made using black lentil paste along with some spices, herbs and sometimes grated gourds added to it. The lentil paste is briefly fermented and then made into drop shaped cakes before dehydrating the in strong sun. Once sun dried completely, the badiyan are kept safe for the whole year to come. These badiyan can be deep fried whole or can be crushed and shallow fried before being added to curries. The pyaz badiyon ki subzi or simply alu badiyon ki subzi is a classic, these badiyan are mean to impart flavour to the vegetables without additional spices added to the curries. Badiyan were generally made during early summers so the the sun drying is done perfectly for year long storage. In older times when there was scarcity of fresh vegetables during summer months and monsoons, these badiyan were use profusely to bring flavour to the table. Now a days when all sorts of fresh produce is available all year round, we can't imagine how it might have been in the older times. 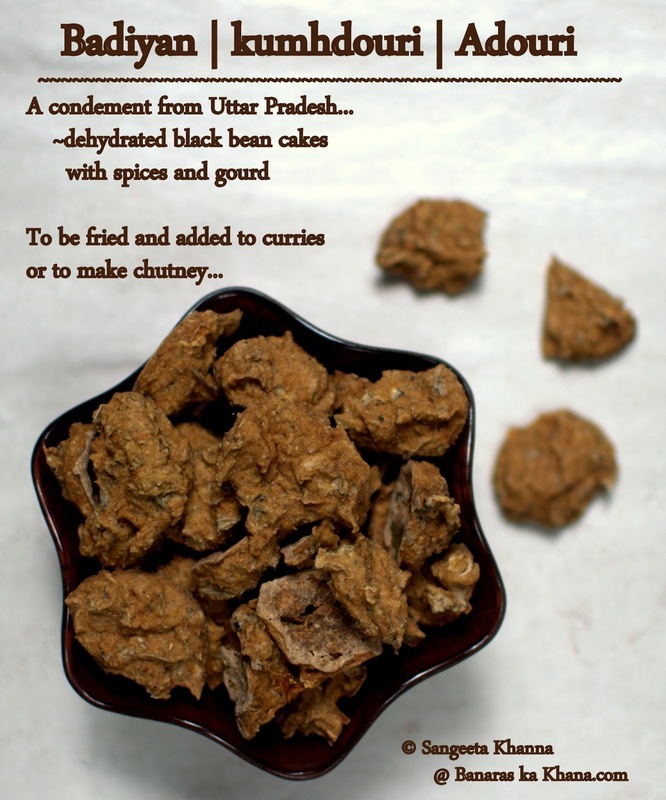 Notably, these badiyan are made using some seasonal gourds that are not regarded too good for cooking purpose but lend a great texture to the badiyan. These are made using grated Ash gourds in UP and I have seen them being made using a large cucumber variety in Uttarakhand. The famous Amritsari vadi or badi has only spices and no vegetables in it, these are bigger in size and more spicy in nature. Use of grated Ash gourd (called as petha or safed kumhda, also used to make Agre ka petha) lends a good texture to these badiyan, the way they make it in UP. Apart from the grated gourd, some chopped coriander greens, some cumin, coriander seeds, peppercorns and chillies are added to make the badiyan flavourful. The real flavour of the deep fried and cooked badiyan is vary different from all these spices put together. The lentil paste fermented and sun dried becomes a very different flavour in it's own, a great way to add Umami to Indian curries I feel. 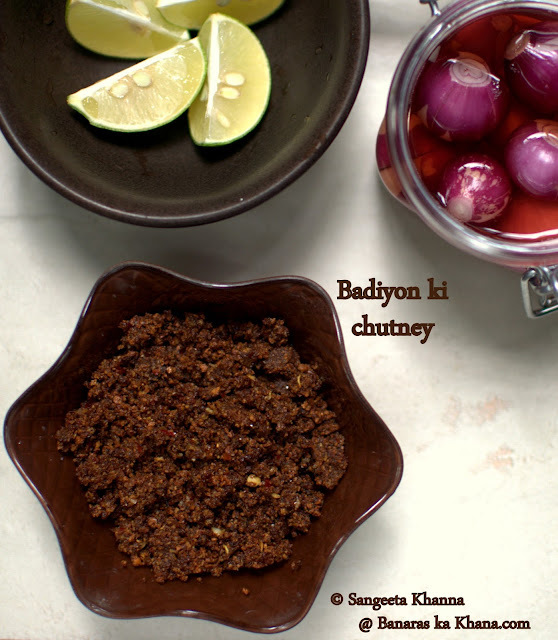 This badiyon ki chutney is an easy to make condiment that lasts a few days on the table. We generally break the badis into smaller pieces to shallow fry them evenly. 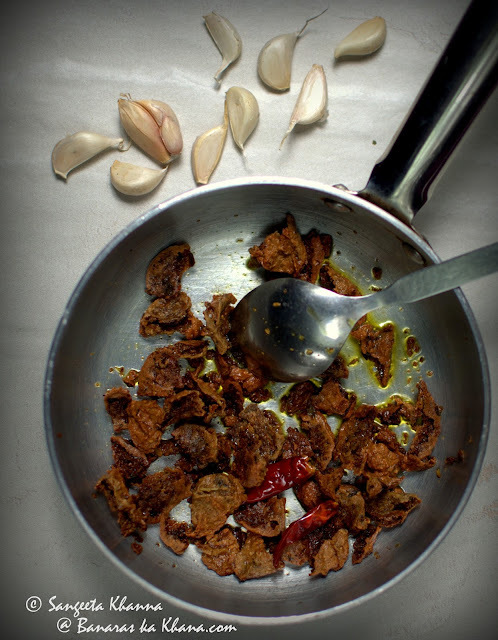 If the badiyan are not too spicy you can fry a couple of red chillies along with them. Just add a few garlic cloves and salt to taste and blend to make a coarse paste. Everything is added to taste, you can make this chutney according to your own liking of chilli heat or garlic. Grind it smooth or coarse, add water or lime juice if required and add some dhaniya patta if you like. 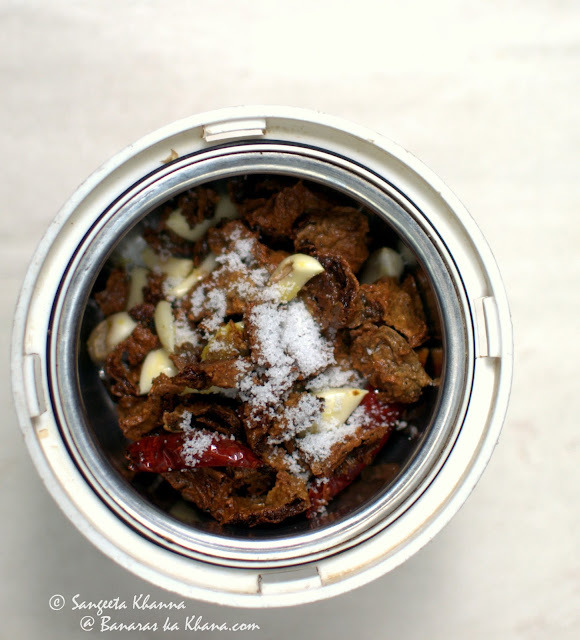 This chutney wont disappoint you. The resulting chutney is a dry crumbly paste that can be spread over parathas, mixed with khichdi or whatever you like with it. I remember my dad used to love this chutney and when I made it after ages I kept eating spoonfuls of it and remembering how he used to make it all by himself. The baby onions in vinegar, sliced ginger and green chillies in brine and this chutney were his favourite condiments on the table. When I asked him a few days ago whether he still makes this chutney, he said he will make it again and that he had forgotten how much he used to love it. With the availability of so many new products on our super market shelves, we are definitely forgetting the foods we used to relish so much. 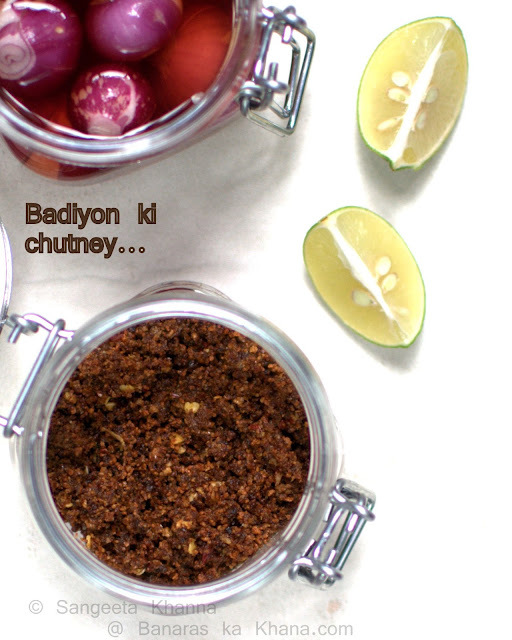 Do try making this chutney wit any kind of spiced badiyan you get and let me know if you liked it. Please tell me if it was made in your home too and how long back. Sometimes I am surprised to bump into people who have similar food memories, are you one of them?